Read through the three COI Frameworks of Social Presence, Cognitive Presence, and Teaching Presence from the American Public University System Center for Teaching and Learning. Make sure to click on the link “Learn more about” under each type of presence. We have seen that without a sense of belonging to a larger learning community, learners in online learning situations can feel isolated. The professional learning leader sets the tone for creating a vibrant, collaborative learning community by modeling social, cognitive, and teaching presence in their online environments. Effort in designing your online learning environments so they foster presence and community is essential. In the next section, we will explore some tools and strategies that can be incorporated and used to build a successful community. Most icebreakers used for face-to-face groups can be adapted for use in online or blended uses. An icebreaker is a great way to have participants begin to get to know each other in a more informal, personal manner. As a Professional Learning Leader, your role includes opening lines of communication, building trust and fostering professional relationships between yourself and the educators you work with as well as between those educators. Welcome emails before a workshop or online course begins, can be an effective way to begin opening lines of communication. In addition to projecting a warm and welcoming tone, these welcome emails can provide information about a variety of support (technical and other) resources available to participants. Knowing about these resources can be very reassuring especially to those who are new to learning and collaborating online. Following the general welcome email with a personal welcome email to each participant deepens the lines of communication. Throughout the course or event a Professional Learning Leader can send personalized messages to the participants, or provide feedback that uses the participant's name in order to reinforce that connection. These check-in emails are especially important for those participants who appear reluctant or are behind in their coursework. Learners report a greater sense of engagement and relationship with facilitators who use images that include their face, images of themselves in informal settings, and their actual recorded voice. Discussion boards are essential tools for building community in online learning environments. These are the online tools that replace the conversation and dialogue that happens in a face-to-face gathering. All online discussion forums can be set up to allow users to post responses to the discussion prompt and reply to the posts of others who have responded to the same discussion prompt. The prompt with its collection of responses is called a thread. If constructed properly, threaded discussions can produce higher order thinking and a sense of belonging to the shared learning community. Well-crafted discussions provide opportunities for participants to communicate with each other in thoughtful, deep, and personalized ways. Participants can share relevant knowledge and expertise from their professional and personal life. Discussion forums also provide an opportunity for individuals to help and support one another. Learners do not automatically know the vocabulary of the discussion area. A thread is one topic, and creating a new thread is equivalent to changing the conversation. In normal conversation, we have visual and verbal cues to help us understand these changes - in a discussion forum, the only available cue is the location of threads and replies. Explicit instruction in how to post a thread and a response can help participants feel more confident in their participation, and ensure continuity in the conversations. Participants need to know that you, as a leader, value participation on the discussion board and have clear expectations about how they are to participate. The quickest way to demonstrate this is to include participation guidelines on the discussion board. (Restine, 2009). Some participants will jump in to the discussion on their own but, with the busy lives of our adult learners, many would not voluntarily do so. It is a common practice to require participants to reply to the discussion prompt and to the posts of one or two others in the course. It is also helpful to provide models of acceptable and unacceptable posts along with the supporting rationale so the participants can begin to critique, and if needed, to modify their posts. The professional learning leader should monitor discussion threads throughout the time they are active. There are times when the professional learning leader should participate in the discussion thread by asking questions to guide and deepen the discussion and to encourage consideration of other viewpoints. In an online learning environment, Professional Learning Leaders can provide mechanisms for informal communication using dedicated discussion forums, sometimes called "water coolers". This informal discussion area provides a space for participants to talk about topics that are not directly related to an assignment which provides opportunities for them to connect in ways that builds an online rapport. Group work is often used as a way to build community and can effectively be conducted online as well as in face-to-face learning situations. Working in teams assists group members in developing their problem solving, communication and critical thinking skills. It also allows them the opportunity to work with and learn from their peers. In the online environment, group work must be carefully structured and monitored to avoid problems with differing expectations, logistics of collaboration, distribution of workload, and conflict situations. Web 2.0 tools such as wikis and collaborative presentations provide clear documentation of the contributions of each team member. Peer commenting and editing provides a sense of accountability and builds relationships between participants. This collaborative learning provides a structure for participants to actively learn with and from each other. Online collaborative tools offer clear benefits for educators working at a distance. Participants are able to work on their own time while still working as a member of a team, providing feedback and edits that benefit the group as a whole. Cool Tools for School has a fairly comprehensive list and set of links to various web 2.0 tools that can be used for collaboration. 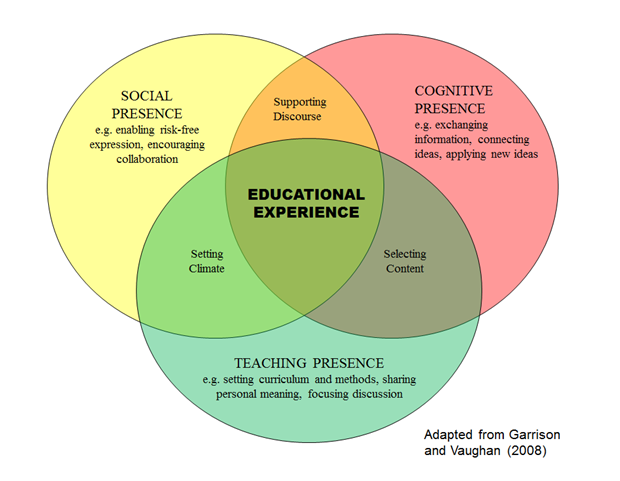 Establishing social, cognitive and teacher presence should be considered in the planning and preparation stage of professional learning events and courses. Develop a plan for an ongoing professional learning event or course which fosters development of teacher and learner presence and development of a participatory learning community. Indicate if this event/course is face to face, blended or totally online.